Located just next to the Sapperton SkyTrain Station as well as the Royal Columbian Hospital in Sapperton, one of New Westminster real estate’s oldest and most storied neighbourhoods, The Brewery District New Westminster master planned community will be a pedestrian friendly district boasting approximately 1.4 million square feet of retail, services, and office space including a Thrifty Foods expected to open in 2011 in addition to the approximately 700 condominiums, lofts and live/work spaces anticipated for development here. The New Westminster Brewery District condos will feature modern, urban design that pays tribute to its industrial roots. As this is a master planned development, the Brewery District New Westminster condos and lofts will be phased over several years and through several launches. For more information about this exciting revival and to priority register for more news about the New Westminster Brewery District condos, please do not hesitate to visit thebrewerydistrict.ca where you will find out more about all of the components that make this district the place to live and work in the near future! Located at the 200 block of East Columbia Street New Westminster, the Brewery District is also next to Royal Columbian Hospital and the Sapperton SkyTrain Station. As well, the New Westminster Brewery District condos will be located in one of the city’s most established neighbourhoods with historic significance everywhere. The Brewery District New Westminster condos will be a pedestrian friendly master planned community boasting about 1,400,000 square feet of retail, service, office and residential space. The residential component of the New Westminster Brewery District condos will consist of approximately 700 condominium residences plus lofts and live/work spaces. Featuring modern interiors with urban designs, the industrial look will be blended in with the contemporary minimalist look and feel to give it a distinct flavour. 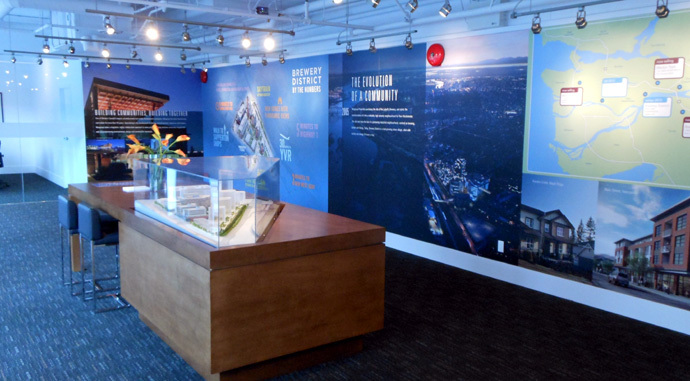 The presentation centre for the Brewery District New Westminster real estate development is now open. The original home of the Labbatt Brewery, a local favourite, the Brewery District New Westminster real estate locale is being transformed into a 9 acre, pedestrian friendly urban neighbourhood which will be the area’s first. Centrally located in the Sapperton New Westminster real estate location, Bluetree Homes at Brewery District New West will present several phases to the project that includes the commercial and retail component of the master plan by Wesgroup Properties and the Bluetree Homes residential condominium and townhouse component to the area. The new high-rise towers at the Bluetree Homes at Brewery District New Westminster condo development will feature a first tower that will offer about 130 suites in a modern building with heritage inspired red brick accent façade. Overlooking the beautiful Fraser River, the Bluetree Homes at Brewery District New Westminster is all about revitalization and the area’s rebirth through the construction of a vibrant campus like community with lots of greeways, parks, pedestrian friendly walkways and a great mix of retail, office and residential space. Some of the newest anchor tenants at the New Westminster Brewery District revitalization project includes TD Canada Trust, 24 hours Thrifty Foods, Take Five Café and many offices for leading companies. In addition, the Bluetree Homes and Wesgroup Properties Brewery District project will see the construction (already underway) of the new corporate headquarters for TransLink the Coast Mountain Bus Company as well as Transit Police. This transit oriented location at the Sapperton New Westminster Brewery District condo project is just a short walk from Royal Columbian Hospital in addition to direct access to the Skytrain Station at Sapperton. The new Brewery District New Westminster condo presentation centre is located at 2080 East Columbia Street New Westminster BC. From the Bluetree Homes Email Desk > We have an exciting update for you on New Westminster real estate’s newest community, The Brewery District, located on East Columbia Street at Brunette Avenue. Bluetree Homes at Brewery District New Westminster has been announced as the builder of the residential towers, and in advance of the start of sales, we are opening the Brewery District Condo Discovery Centre to give prospective buyers and our neighbours a sneak-peak of what is to come. Bluetree Homes at Brewery District New West is a leading residential developer that comes from ParkLane Homes and its 30 years of award-winning experience. Our projects range from high-rise concrete apartments and mixed-use buildings in urban centres, to wood frame apartments, townhomes and single-family homes in the Fraser Valley and Tri-Cities. As ‘your friendly neighbourhood builder’, our aim is to create exceptional home-buying experiences, such as the Bluetree Homes at Brewery District New Westminster condo opportunity upcoming. The New Westminster Brewery District site is located adjacent to Sapperton SkyTrain station and Royal Columbian Hospital, and is already home to Thrifty Foods, Take 5 Café, TD Bank, and a variety of medical offices. Translink, Transit Police, and Coast Mountain Bus will move their head offices to the building currently under-construction and it has just been announced that Brown’s Social House will be opening a restaurant at the New Westminster Brewery District real estate development community as well. When complete, Brewery District will be New Westminster real estate’s premier mixed-use community. Wesgroup will continue to develop the commercial mixed-use component of the Brewery District through to completion, and will retain long-term ownership of the commercial mixed-use development. The first residential high-rise tower at the Brewery District will be comprised of approximately 130 homes and will become available this winter. Welcome to the Brewery District, a new urban community overlooking the Fraser River in New Westminster. 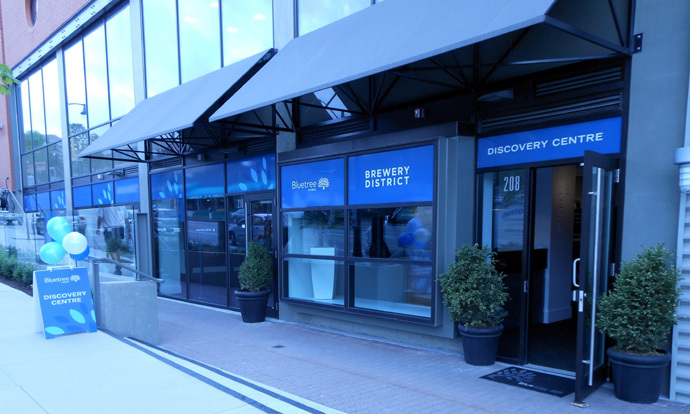 Centrally located in the heart of the historic Sapperton New Westminster real estate neighbourhood, the Brewery District is a walkable urban community that offers rich amenities and direct access to SkyTrain. 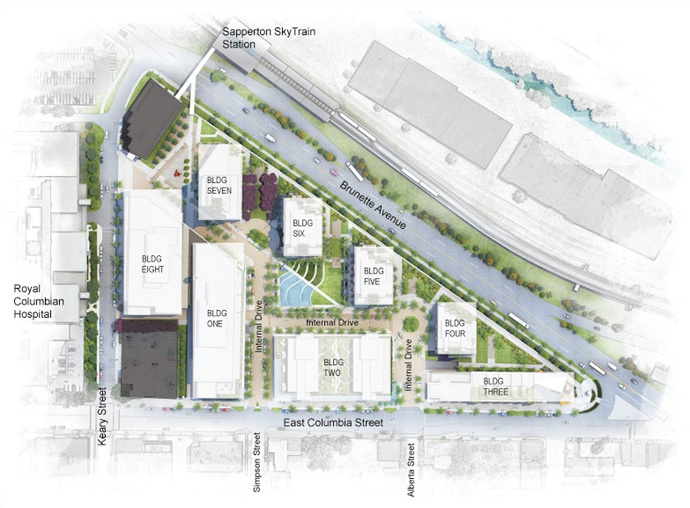 Public plazas and greenways will enhance the New West Brewery District, giving it a vibrant campus-like feel. The building architecture combines modern elements with the red brick facades that celebrate the rich heritage of this historic site. When complete, the Brewery District New West real estate development by Bluetree Homes and Wesgroup Properties will encompass over 750 new apartment homes. New amenities already built and open include a 24-hour Thrifty Foods, TD Canada Trust and Take Five Café, with much more to come. Brewery District will also be home to the new head office for Translink and Transit Police. Bluetree Homes will soon begin building the first residential high-rise tower at New Westminster Brewery District neighbourhood, a master planned community. The first phase of the Brewery District New Westminster real estate development will offer up to 130 homes, but when the master planned community is completed, the entire project will introduce over 750 homes to the spectacular locale with a variety of floor plans and housing styles for today’s homebuyers. 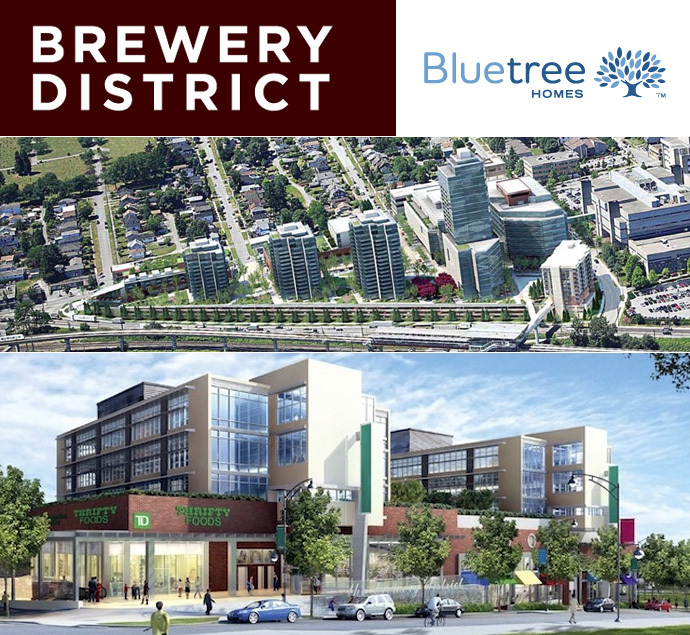 Some of the new Bluetree Homes Brewery District New Westminster real estate development amenities include a 24 hour Thrifty Foods, TD Canada Trust bank and Take Five Café. The New West Brewery District community will also become the future headquarters for both Transit Police and TransLink.